A special edition of Pokémon: Red & Blue Version. Inspired by the TV show, you start the game with Pikachu who follows you around rather than travelling in a Poké Ball. You can also find Bulbasaur, Charmander and Squirtle depending on how happy Pikachu is. 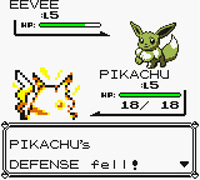 Battle graphics have been improved and the game has more support for the Super Game Boy and Game Boy Color palettes. A new Surfing minigame has been added, and you will face Jesse and James of Team Rocket.